Guests of Adventures on the Gorge bask alongside a waterfall in the New River Gorge region. With its lineup of customizable two-, three-, and four-night “Explore the Gorge” packages, featuring action-packed and more-relaxed options, it’s never been easier arrange a getaway at Adventures on the Gorge. Available through Labor Day 2017, the multi-night packages combine lodging and meals with adventure activities such as rafting, zip-lining, kayaking, rock climbing, paintball competitions, and stand-up paddleboarding. Lodging choices include luxury homes, multi-bedroom deluxe cabins with private hot tubs and several other cabin options, hotel suites and campsites, and the resort on the rim of the New River Gorge offers three restaurants as well as two popular bars. Guests are also invited to enjoy the resort’s full range of offerings, which include live music, free events such as disc golf, a playground, and the 3,000-square-foot Canyon Falls swimming pool with rock formations and waterfalls. When designing Explore the Gorge packages, guests first choose the number of days of adventure and lodging preferences. Next, they choose their adventures categorized by the length of time required to complete the activity. Reservations agents are available to help guests make the best choices of adventures and lodging. All packages are priced per person and do not include taxes or gratuities. Alcohol is not included in the meals. All full-day adventures include lunch. Children 12 and younger save $50-100 on per-person rates. For a day of adventure, guests can choose a full-day activity like river rafting, Kids Camp or guided rock climbing. Full day adventures can also be upgraded with “Learn to Adventure” programs – expert activity instruction – float fishing or kayaking tours. All full-day adventures include lunch. 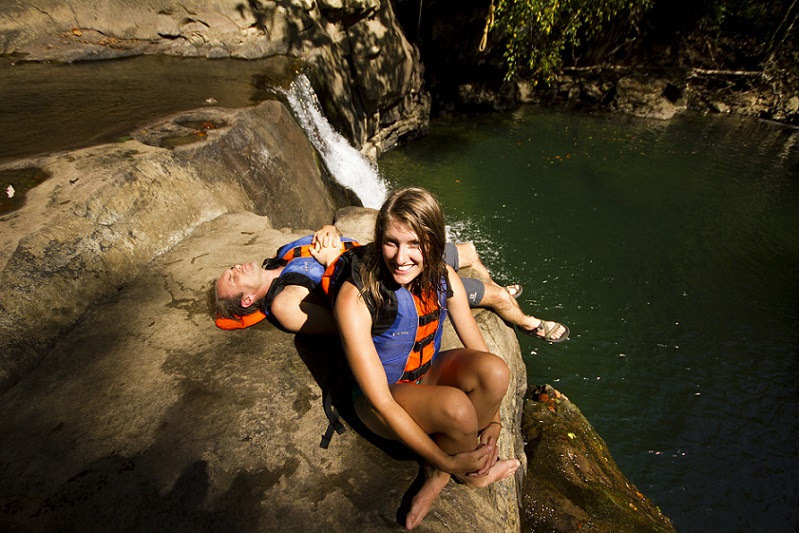 Guests can also choose a bonus evening adventure for each full-day on their package such as rappelling, kayaking and Fat Kat tours. Half-day adventures (up to two per day) include stand-up paddleboarding, Bridge Walk, guided mountain biking, Gravity Zip Lines, TreeTops Canopy Tours and paintball. Half-day adventures also can be upgraded. A complete list of adventures is available online. Action-Packed packages start at $399 per person, and they include daily non-stop action. For example, a three-day package could include one day with a full-day adventure, one day with two half-day adventures and one day with a half-day adventure and a fun evening adventure, plus three nights of lodging, three breakfasts, three lunches and three dinners. More-Relaxed packages start at $319 per person. A two-day vacation includes one and one-half days of action and a half day of relaxing along with two nights of lodging, two breakfasts, one lunch and one dinner. A four-day vacation includes three days of action and one day of relaxing, plus four nights of lodging, three breakfasts and two dinners. Located on the New River Gorge in near the town of Fayetteville, West Virginia, the resort is within a region of three stunning areas of national parkland. The parks include the New River Gorge National River, encompassing more than 70,000 acres along 53 miles of the New River; the Gauley River National Recreation Area, including 25 miles of the Gauley River; and the Bluestone National Scenic River, a 10.5-mile section of unspoiled and protected river that is a haven for a vast array of plants and animals. To book adventures, accommodations or packages, call 1-855-379-8738. Travelers can find out more about Adventures on the Gorge and learn about specials and other offers by connecting on Facebook or Twitter, signing up for their e-newsletter or following the their blog.